80s color palette, 90s soundtrack, and modern arcade feel. Is it any wonder we’re smitten? It’s pretty common knowledge that I’m one of the Arcade Racing faithful around this site. I’ve launched and maintain a YouTube playlist dedicated to bringing Ridge Racers 2 stateside as part of Sony’s #BuildingTheList initiative. Not only did I point out that Dan Clarke’s minimalist OutRun fan poster would be an outstanding stylistic foundation for Sega to build the development of an OutRun 3 around, said poster stands to this day as my smartphone wallpaper. I recently attempted giving the genre some more exposure in the form of an All-Time Greatest Arcade Racing Courses piece, and am currently working with Filippo on a list of the All-Time Greatest Arcade Racing Games altogether. Sadly, Arcade Racing — the genuine article, not the overly busy, faux-machismo-fueled “Action Racers” that have all but replaced them in the marketplace — is a genre on life support. The usual suspects, Sega and Namco, chipped in over the course of the last several years, but license expiration plagued Sega’s offerings to the point of discontinuation, and the one Namco really should have put on console, the aforementioned Ridge Racers 2, they didn’t. True Arcade Racing needs a revitalization, and it may very well be primed for one. 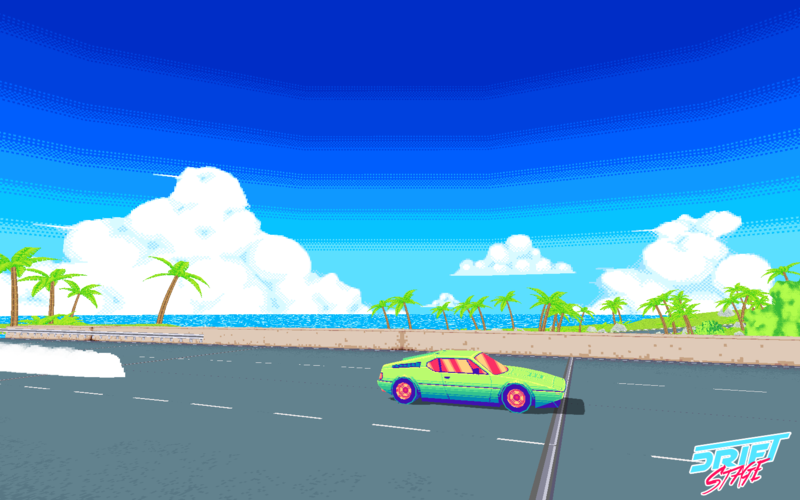 We haven’t had the pleasure of playing the Ocean Bridge course yet, but with all the blatant 90s Sega imagery, we can’t wait. Of all the big games in the pipeline for 2015, you can’t really begrudge someone not knowing about Drift Stage, Super Systems’ love letter to that classic brand of Arcade Racing that just happens to be in need of a hero. Built in the tradition of such 80s hits as Rad Racer and OutRun, Drift Stage not only seems fully aware of the problems with today’s Racing genre, it seems intent on taking upon itself the responsibility of fixing it. Super Systems’ recently-released public alpha of Drift Stage is incredibly raw, but speaks well to the game’s ambitions. 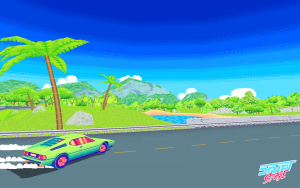 (To say nothing of the developers’ skill levels at their own game, as they had me convinced through promotional videos that they had successfully ported the OutRun 2 engine by hand, until I tried playing the game for myself and realized it was certainly not that.) 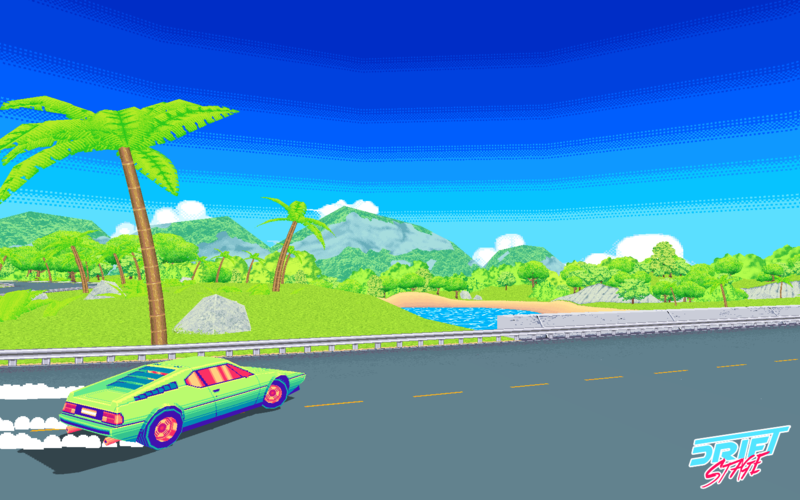 The game’s minimalistic, but loud, color palette immediately forces your mind back to some of those great arcade and console racing games of the late 80s and early 90s. 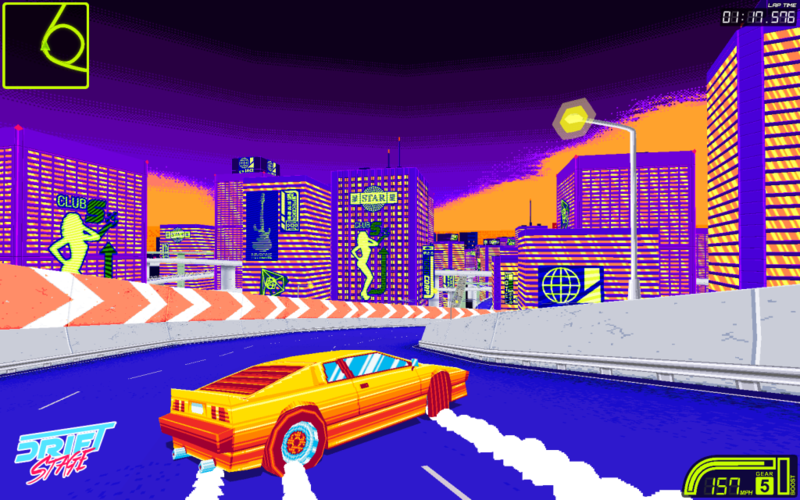 The very first corner of the demo course, Sunset City, will instantly and simultaneously teach you how easy it is to understand the handling and how much practice will be required to master it, and the background theme, Exclusive Coupé, strongly implies that composer Hugh Myrone is about to drop a soundtrack worthy of anything we’ve gotten from Sega’s Hiroshi Miyauchi over the years. Another shot from Ocean Bridge. We can’t help but wonder how badly they had to restrain themselves from calling it “Sunny Beach”. The core physics, clearly still early on in development and openly acknowledged as being subject to change, already show lots of promise. The drifting feels very distinct and immediate, and honestly doesn’t need much tweaking in and of itself, although a couple of rather ambiguous corners force you into drifting awkwardly for only a split second when it would feel much more natural to ease off the gas and grip around them. There’s no working alternative at this point, though. Braking all but guarantees you’ll go into a drift, and coasting causes you to retain almost all of your speed with no magic-of-gameplay-mechanics giving you a bonus to your handling, thus not affording you any extra turning radius by easing off the gas. Perhaps another car might be built around this mechanic, though, as only one is playable in this demo. Even so, there’s a great deal of brilliance to be found in Drift Stage, even in its current fresh-off-the-drawing-board form. Sunset City seems tailor-made to show off the game’s signature look and feel, with a couple of corners quite obviously in place to inspire “a-ha!” moments as you’re learning the controls. The last turn on the course, in fact, is an uneven corkscrew that makes sure you’re one with both the analog stick and the throttle the entire way down, and right now, it’s so close to Sunset City’s start line that laying down a good time and competing with the demo’s time attack ghosts (as well as your own) is incumbent upon you nailing that final section and finishing your lap at or near the currently-imposed top speed of 170 mph. 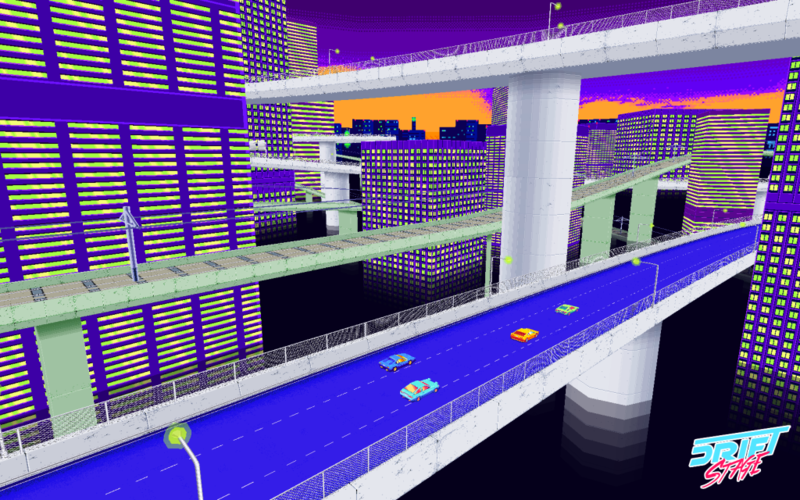 Almost a Ridge Racer V feel coming from this overhead shot of Sunset City. 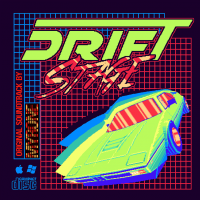 Drift Stage is currently on track for a 2015 release with a round of crowdfunding just underway. We could say a lot more, but there will be time for that later, as the demo does a very good job of speaking for itself right now. Rest assured, we’ll be covering this game obsessively throughout its development, so stay tuned here at Smashpad for more information.